Hospitals are among the biggest energy consumers in the country. When you think about it, this makes perfect sense—hospitals operate 24/7, their occupants include hundreds (or thousands) of employees, patients, and visitors, and they require sophisticated HVAC systems to control temperature and airflow. Add in the energy-intensive activities that happen within hospitals—medical equipment use, complex IT infrastructure, food service, refrigeration, laundry, and more—and it’s no wonder that hospitals have such high energy use requirements. Initially, when a hospital project is being planned, the project costs are scrutinized intensely by owners, board members, and the public. This directly relates to the energy performance of the hospital, because HVAC and process systems represent significant portions of the initial cost of a facility. As a result, design choices, trade-offs and compromises often need to be made in these areas. And yet, despite this scrutiny, energy costs can actually be difficult to predict accurately in the design phase of a project. Estimations for use profiles, occupancy rates, and schedules—all of which impact energy consumption—are all based on assumptions about how the buildings will actually function. What does this mean for the building’s life cycle cost? It means that, while money may be saved on the initial building cost, over time, the building will be more expensive to operate. Operating under tighter budgets than ever, hospitals are expected to minimize life cycle expenditures while also optimizing operation productivity. The most effective way to do this is by making an upfront investment in energy performance. What happens when facilities cut corners on energy infrastructure? 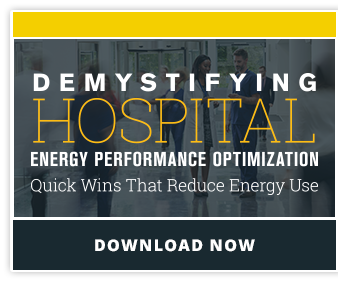 Energy performance impacts each individual area of the Triple Aim, directly affecting a hospital’s ability to improve the quality of their care, maintain the health of everyone inside, and especially reduce the cost of health services. If the hospital can accomplish these three goals, not only will they be optimizing their operations, but they will be reducing the life cycle cost of their buildings. By being more energy efficient, hospitals around the country can save money, reduce or even prevent greenhouse gas emissions, improve the air quality within their communities, and support their commitment to public health. Hospitals can then reinvest savings from improved energy performance into improving patient care or the facility itself. It is never too late for hospitals to evaluate their energy consumption and work toward improvement. Take the first step today – contact North Country Mechanical Insulators for an Insulation Energy Audit and find out how much money and energy your facility could save.